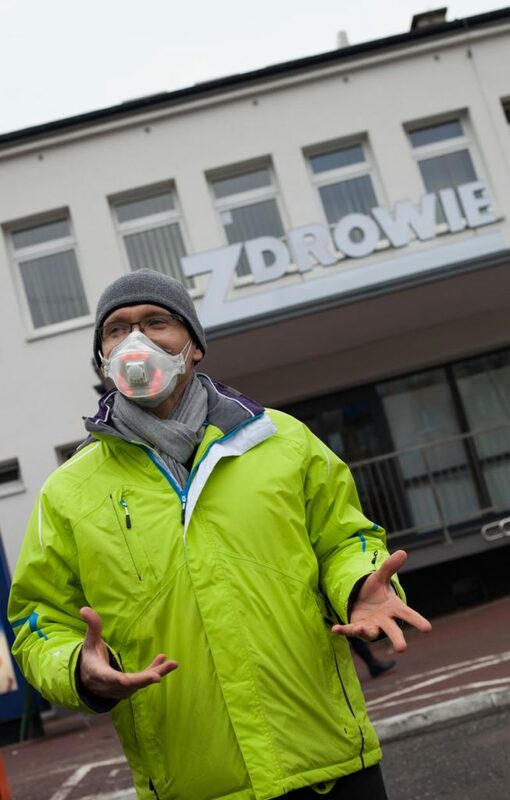 Allergist, Dr Piotr Dąbrowiecki wears an LED light mask showing real time measurements of local air pollution levels (red, unhealthy), in front of a sign reading “Zdrowie” (Health) outside his clinic. Poland has some of the worst air in Europe. 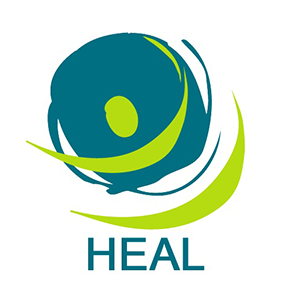 It constantly breaches both World Health Organisation (WHO) and European Union (EU) air quality standards, resulting in more than 45,000 premature deaths every year. Coal is the single most important contributor to our poor air quality, with over 80 per cent of energy still produced from this dirty fossil fuel. Over three million homes still burn coal for heating, causing the “low stack emissions” that make up over 50 per cent of particulate matter pollution in the country. These particulates end up in people’s lungs causing an increased risk of respiratory and cardiovascular diseases such as asthma, chronic obstructive pulmonary disease, heart attacks and stroke. After coal, road traffic is the next largest cause of air pollution in Poland – particularly in big cities such as Warsaw, where every day over one million cars commute in and out of town. Warsaw’s coal burning and cars and trucks also contribute to climate change. Coordinated action to reduce emissions from fossil fuel emissions is essential. The only sure way to protect public health, the health of the Polish economy, and the health of our shared global climate is to eliminate the sources of air pollution and unmask our cities! Air pollution is a serious problem that puts our health at risk, however citizens are not sufficiently informed about this invisible threat. Smog alert levels are the weakest in Europe, and should be strengthened to appropriately warn people when they need to take precautions. Even then, alerts alone are not sufficient to protect our health from dirty air. Ambitious regulations on stoves, boilers, and low stack emissions from fossil fuels are also needed urgently.